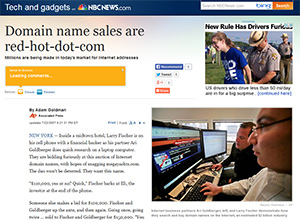 NBC News covered a domain auction organized by Moniker in 2007, presenting “dramatic” coverage of live activity by bidders Ari Goldberger and Larry Fischer. Someone else makes a bid for $120,000. Fischer and Goldberger up the ante, and then again. Going once, going twice … sold to Fischer and Goldberger for $150,000. “You got it,” a smiling Fischer tells Eli. Mazel tovs are exchanged. For the full article, titled “Domain name sales are red-hot-dot-com” click here. Domain.com.au : This Australian domain is not about domains! That was an amazing auction. I believe it still holds the record for total sales in a domain auction. Would love to read comment from Larry Fischer on his thoughts about changes in the domain industry from 2007 to now, and the future as he sees it.